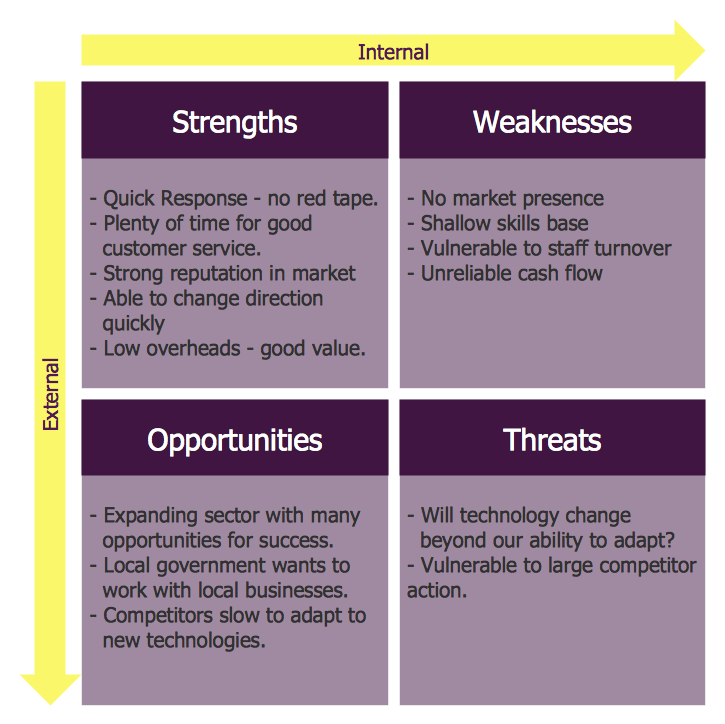 The SWOT Analysis provides information that is helpful in matching the firm's resources and capabilities to the competitive environment in which it operates. As such, it is instrument in strategy formulation and selection. The ConceptDraw DIAGRAM extended with SWOT and TOWS Matrix Diagrams Solution and ConceptDraw MINDMAP software allow professional to make well-designed SWOT matrix in minutes. Strengths are company's resources and capabilities that can be used as a basis for developing a competitive advantage. Weaknesses are the competitive capabilities absence may be viewed as a weakness. Opportunities are the external environment may reveal certain new opportunities for profit and growth. Threats are changes in the external environmental also may present threats to the firm. The SWOT and TOWS Matrix Diagrams Solution contains easy-to-use templates, samples and examples that help identify Strengths, Weaknesses, Opportunities, and Threats using ConceptDraw DIAGRAM software. The samples you see on this page were created in ConceptDraw DIAGRAM using the tools of SWOT and TOWS Matrix Diagrams Solution. These TOWS matrices successfully demonstrate solution's capabilities and professional results you can achieve. An experienced user spent 10 minutes creating every of these samples. All source documents are vector graphic documents. They are available for reviewing, modifying, or converting to a variety of formats (PDF file, MS PowerPoint, MS Visio, and many other graphic formats) from the ConceptDraw STORE. The SWOT and TOWS Matrix Diagrams Solution is available for all ConceptDraw DIAGRAM or later users. 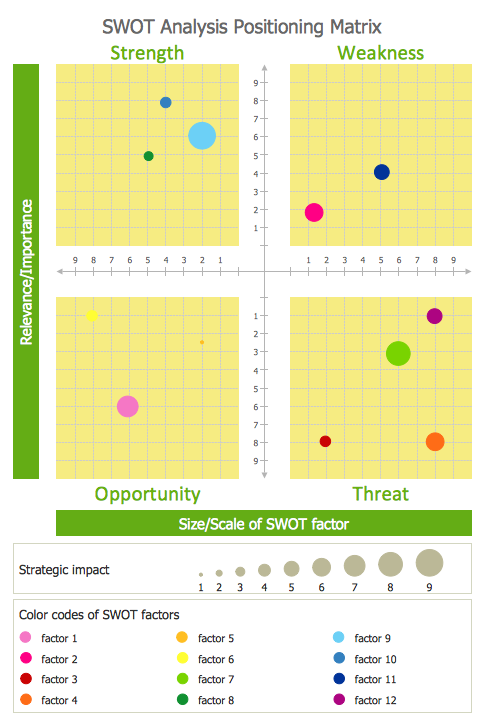 SWOT matrix is a structured planning method used to evaluate the strengths, weaknesses, opportunities and threats involved in a project or in a business venture. ConceptDraw DIAGRAM v12 diagramming and vector drawing software extended with SWOT and TOWS Matrix Diagrams Solution from the Management Area will help you design SWOT Matrix of any complexity quick and easy. Competitor analysis is a first and obligatory step in elaboration the proper corporate marketing strategy and creating sustainable competitive advantage. Use powerful opportunities of numerous solutions from ConceptDraw Solution Park for designing illustrative diagrams, charts, matrices which are necessary for effective competitor analysis. Mind map template of a strategy map that can help you display a variety of performance measures that can have an impact on your organization. A lot of business process techniques are able to be applied in regular life. Although this tool is considered to be used for business purposes, you can make a SWOT template for yourself. In fact, any obstacle might become a subject for SWOT analysis. Every good manager has to predict different situations that might occur in any process. If only every of them Swot Analysis Examples at that time, I could have succeeded in my career. Unfortunately I didn't have any notion about it. 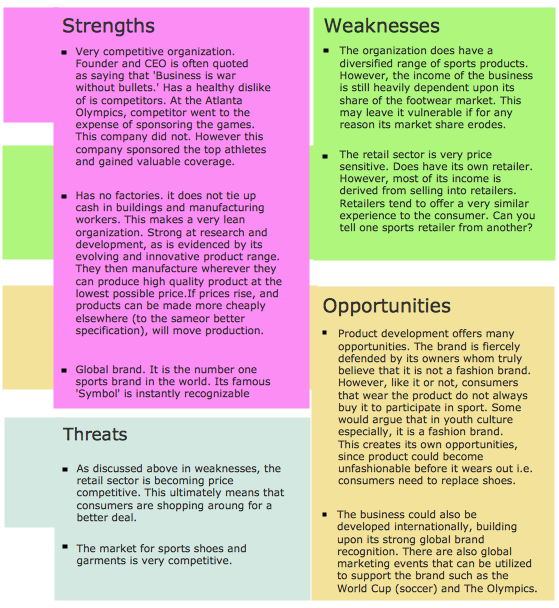 This is a sample of SWOT diagram. This is also a mean of marketing strategy elaboration. Before as filling this table, marketing manager has to investigate both external and internal factors. The effective SWOT analysis helps to gain benefits from opportunities and decrease threats by conversion of strengths and weaknesses into advantage. The SWOT and TOWS Analysis solution to ConceptDraw offers a number of template matrices for SWOT, designed to support a marketing strategy development process.